The title of this post is probably unfair, since the authors of OSWorkflow provide a built-in JMSMessage action to do Fire-and-Forget style calls to a JMS Queue or Topic. However, what I describe here takes that integration one step further, by marrying event-based OSWorkflow processing with Asynchronous with Callback style JMS calls using Apache ActiveMQ. My application needs to fire long running batch job which are dependent on each other. Rather than have a human operator fire them off in the right sequence, the idea is to build a workflow that captures these dependencies, then submit them asynchronously to a JMS queue. As each job complete, the JMS listener which executes these jobs on the other end sends callbacks to the workflow, which allow it to fire the next job in the dependency graph. There are three main components in here. First the WorkflowRunner, which loads the OSWorkflow configuration for the workflow into memory. It is called once from an external client (probably a web user) to kick off the workflow. Each workflow step that is responsible for executing a batch job is tied to a custom JmsAction which writes a message to the request.topic Topic. At the far end of the Topics is a JmsServer component, which basically delegates off to Java processes representing each individual batch job. Once a job is complete, it writes a message to the response.topic Topic. This message is picked up by the correct JmsAction, which then publishes an event into the Spring ApplicationContext. The WorkflowRunner then picks this event up, and issues calls to process() recursively until the workflow is complete. The diagram below illustrates this flow. I describe below each of the individual components. First, the OSWorkflow workflow definition file. Each of the steps are mapped to a JmsAction instance. This is the only difference from the previous week, when everything was mapped to a MockAction instance. As mentioned above, on the OSWorkflow side, we have a WorkflowRunner component. It implements ApplicationListener so it can respond to callbacks from the JmsAction components. Moving through the workflow takes place in the process() method. The onApplicationEvent() recursively calls the process() method based on events received from the JmsAction instances. Not too many surprises so far for people who have read my previous blog post. 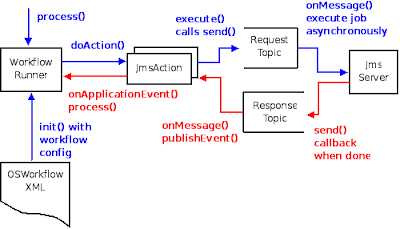 The JmsAction is our bridge between OSWorkflow and JMS, so it has to implement multiple interfaces. The FunctionProvider interface is so it can be injected as a function into the workflow XML configuration. ApplicationContextAware is so it can publish events back into Spring's context where it can be picked up by WorkflowRunner, and MessageListener is so it can listen on JMS events. The code is shown below and is fairly self-explanatory, comments are inlined where I felt more explanation may be helpful. * listener to move the workflow forward. * by workflowId as a comma-separated list. I started off using Spring's JmsTemplate because I wanted to learn how to use it, but gave up when I could not find a clean way of registering a JmsAction as a listener. If any of you have used JmsTemplate for beans which are both publishers and subscribers, please let me know. Example code (or links to example code) would be greatly appreciated. One more thing to note is that unlike the WorkflowRunner, which will have only a single instance per workflow, there will be many instances of JmsAction for a given workflow. We specify that its scope is prototype (built every time it is accessed from the Spring context), and that its lifecycle methods are init() and destroy(), all in the Spring configuration above. * when the job is completed. To test this, we start off the following two unit tests which run forever until they are manually stopped by a Ctrl-C at the command line. The reason I had to do this instead of packaging the whole thing into a single JUnit test as I had done before, was because I noticed that the unit test completed before the workflow had a chance to complete. Since the whole thing is event driven after the first call, there is no way to keep the test running until the workflow is complete. In real-life, this is not a problem because these are likely to be long-lived server processes anyway. This JUnit test starts the JmsServer end of the setup and loops forever, sleeping for 0.5s between loops. I run this in one console window. This JUnit test starts the OSWorkflow end of the setup and after the first call to process(), also loops forever. I run this in a second console window. Running these produces the following output on the client end, and a similar output on the server end. Looking at the output, it is clear that the setup works, ie the output is what you would expect given the dependencies designed into the workflow. A nice tool that helped me debug my code is ActiveMQ's web-based administrator interface. Here you can see how many messages were received and sent on each of the topics. You can delete messages off the queue, which is very helpful after unsuccessful runs. It is available at 0.0.0.0:8161 of the machine where ApacheMQ is started. So there you have it folks. A simple, asynchronous, event-driven way to manage dependencies among multiple batch jobs. I would like to try to run your example, but I am new to all this. Is it possible for you to make the whole code available (with ant, or maven script) so that it can be built and tested? To answer your question, sorry, no I cannot, because I don't have the code anymore. However, to run the examples, just do the following. 1) Create a maven project with archetype:create. 2) Create src/main/resources and copy over the applicationContext.xml and the osworkflow.xml file into it. 3) Copy over the Java source classes into src/main/java, creating any necessary packages (from the package declaration). 4) Copy over the Java test files into src/test/java, as above wrt package names. 5) Create a pom.xml (or ant build.xml) if that makes more sense) with necessary library dependencies. 6) To run the test, use mvn test -Dtest=JunitTestShortClassName.